The PalmTrack is an extremely affordable pocket-sized recorder with plenty of features — but have Alesis sacrificed quality to keep costs down? Analogue Solutions get back to basics with their new sequencer, the Europa. Once installed, this little flute library, created by producer Eduardo Tarilonte and flautist Carlos Soto, comprises around 470MB of samples. Canons 550D (known as the Rebel T2i in the US) promises the same video quality as their acclaimed 7D, for half the price. Is this now the cheapest way to make a high-quality video? The Carillon PC is back, but how does it measure up in the modern computer market? Despite the ubiquity of the SM57 for use on snare, there are other options — and Earthworks aim to help you capture a more natural sound. Fluxs innovative dynamics processor adapts to your programme material in a much more sophisticated way than conventional compressors. But how does it sound? The Formanta Polivoks is becoming an increasingly familiar sound to Western ears — it is, for example, all over Franz Ferdinand’s most recent album Tonight. But for those who haven’t heard this mighty Russian beast in action, Sam Inglis created a few examples to accompany Gordon Reid’s Retrozone feature. Galaxys new star expands the sampled piano universe. Was Laurens Hammond a time traveller? The inventor of the world‑famous Hammond organ certainly created a temporal blip when he launched a polyphonic synthesizer in 1939. The resurrection of Moogs stellar bass synth has caused a considerable stir. Can the Taurus 3 live up to the venerable reputation of its ancestor? We put MXLs Genesis through its paces alongside a much pricier model, to find out just how good a tube mic can be at this price. To accompany our July 2010 Genesis review, we recorded a series of standard tests with the review mic alongside a more established mic (in this case, the AKG C12 VR). These little mixers could provide the ideal starting point for would-be computer musicians — and at this price, whats not to like? PMC broke new ground a decade ago with their TB2 monitors, but the competition have been catching up. Does PMCs new activated design nudge them back to the front of the pack? For the latest additions to their Native Effects bundle, Sound Toys have updated two vintage effects for the DAW age. Is a high-quality valve preamp in a programmable pedal just what the SpinDoctor ordered? Tascam break from the crowd with their new USB 2 multi-channel audio interface. Universal Audios latest plug-in, based on Manley Labs classic Massive Passive EQ, is being hailed as the best emulation yet of a hardware unit. So how would it fare when we pitted it against the real thing? A selection of audio files comparing the Manley Massive Passive EQ hardware with the Universal Audio Massive Passive plug-in. New to the world of video production and unsure what gear to buy? Our quick one-page guide to the five best options will get you started. Just how do you write musical cues to match the length of a video in Cubase? The key to unlocking the power of Native Instruments Kontakt sampler lies in its Script Processor. Take advantage of this powerful feature to customise your Kontakt patches any way you like. An introduction to elementary DJing in Ableton Live. Like drum & bass and jungle before it, dubstep showcases the inventiveness of British urban music. We explain some of its fundamental production techniques, from wobbly bass lines to half-time drum programming. If you cant afford to shoot with multiple camcorders, it may not matter — with a little trickery and a single camcorder, you can produce pretty much the same results. How to make your guitar sound ‘shimmer’ using chorus and other effects. Find out exactly what effects Paul White is talking about in this months Guitar Technology. This month, we were tasked with overhauling the sonics of a mix while still retaining the magical 'vibe' of the original. But 'chasing the demo' can be a risky tactic! These audio files accompany the Mix Rescue article that featured in SOS July 2010. With recent revisions to the Take feature, Logic Pro 9 now has all the tools you need to craft the perfect vocal track. The Tool window is the key to some nifty sequencer manipulation in Propellerhead's Reason and Record. Use track templates to give your electric guitar an acoustic sound and perk up your synths. The SOS team travel to Norway to help recording artist Thomas Dibdahl achieve the right balance between studio acoustics and his own unique views on aesthetics. 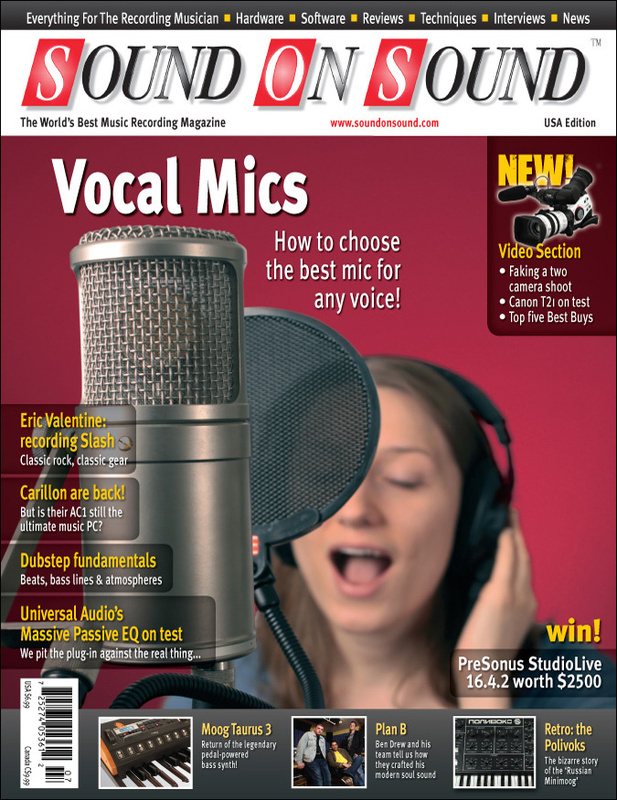 No two human voices are the same, and no mic will be the perfect fit for every voice — so just how do you go about finding the best match for a vocalist? Hear for yourself how each mic sounded on the different vocalists. It might be a free plug-in, but the Xpand! sample player bundled with Pro Tools has some serious potential. In 1969, Faust used their massive record company advance to build a unique studio and a collection of weird, custom-made effects units. The same experimental spirit lives on in their new album, Faust Is Last. Plan B entered the public eye as a rapper, but its as a soul singer that he has conquered the charts. He and his production team revisit the tortuous story behind The Defamation Of Strickland Banks. Whats the best way to make a classic rock album? For producer Eric Valentine and guitarist Slash, there was only one answer — use classic recording techniques and vintage gear. Q. How should I mic an accordion? Read more about Q. How should I mic an accordion? Q. Should I be time-aligning my drum tracks? Read more about Q. Should I be time-aligning my drum tracks? Q. Should I use faster RAM, or more RAM? Read more about Q. Should I use faster RAM, or more RAM? Q. Why do I sometimes see singers using two microphones on stage? Read more about Q. Why do I sometimes see singers using two microphones on stage? Want to be a media composer? Get used to being the most anonymous cog in the TV production wheel. Media content for the July 2010 issue.